Third Year = Craft Year? 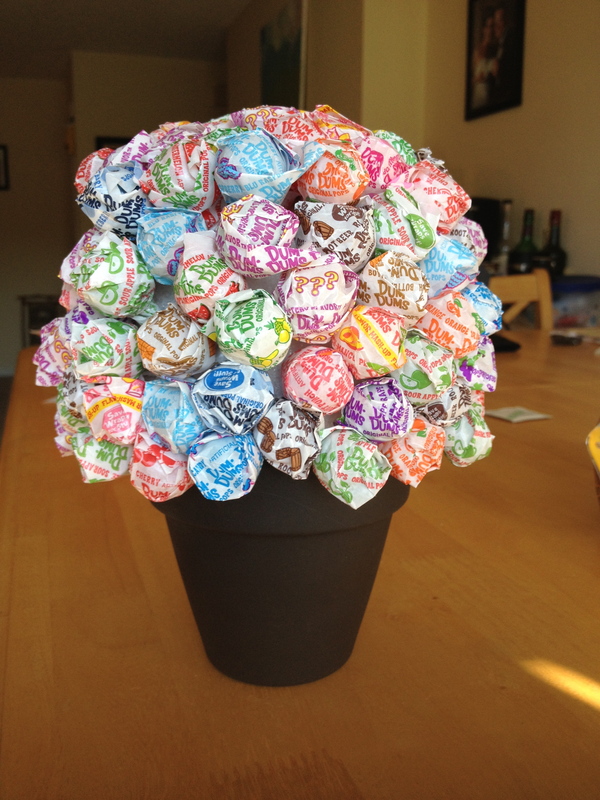 So apparently my third year of teaching at Payson means that it is time for me to start sprucing up my classroom a little bit more with some great craft ideas which I of course found on Pinterest. I have found so many great ideas for my classroom for this year using this website that I can’t even keep up with them all. Pinterest has become a great place for teachers especially to share resources and classroom ideas. It is normally fairly difficult for me to find high school level products and resources in the store that having this great resource makes me even more excited for all of the plans I have for this school year and keep track of them on my Classroom pin board. While there were some great bulletin board ideas, I am really excited to share the more “crafty” projects that I made over the summer and even one from today (we had an early dismissal day due to this crazy hot midwest weather). 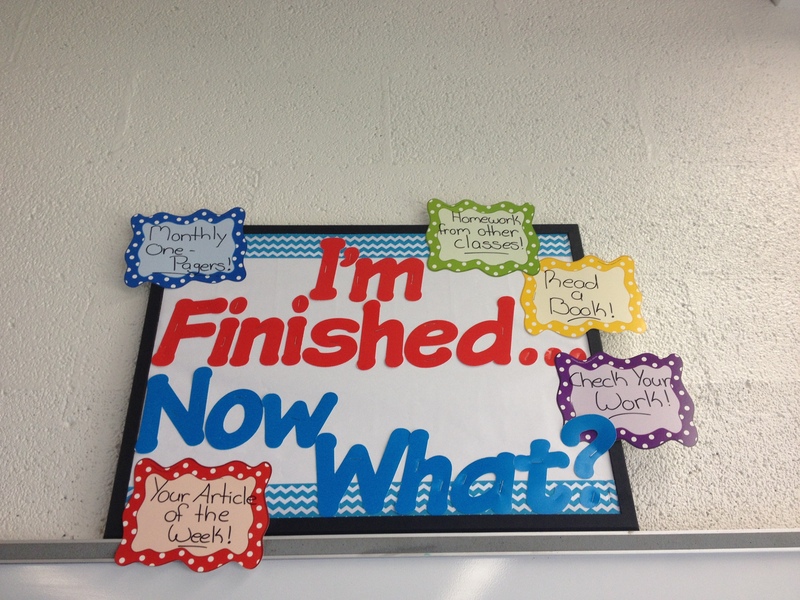 The first project that I worked on was creating a small bulletin board for students to refer to if they finish with their class work early. This board was an idea that I found on Pinterest, but because of the materials that I had available to me, I modified the look of it and also bought some ribbon to match the basic theme I have for this year. (I decided to go with bright colors with pops of chevron.) For this project I used a small bulletin board that was on sale at Hobby Lobby, chevron ribbon, black paint (that I already had from another project), and small paper cut-outs I had bought at a teacher supply store. After it was all complete I placed this board above the whiteboard at the front of my classroom where it is visible to my students at all times. My completed project is below and you can see the original inspiration here. The small board I made and placed above my whiteboard. I made a second board similar to the one above based on an idea that I saw in an office at another school. In the office they used their board for sending out passes and notes to students during the day and had them pinned to the board for the specific hours. While I did keep the concept of dividing the board into class periods, I wanted to utilize this board to pin up papers that need to be passed out to the classes to keep papers from cluttering up my desktop (which kept happening last year.) 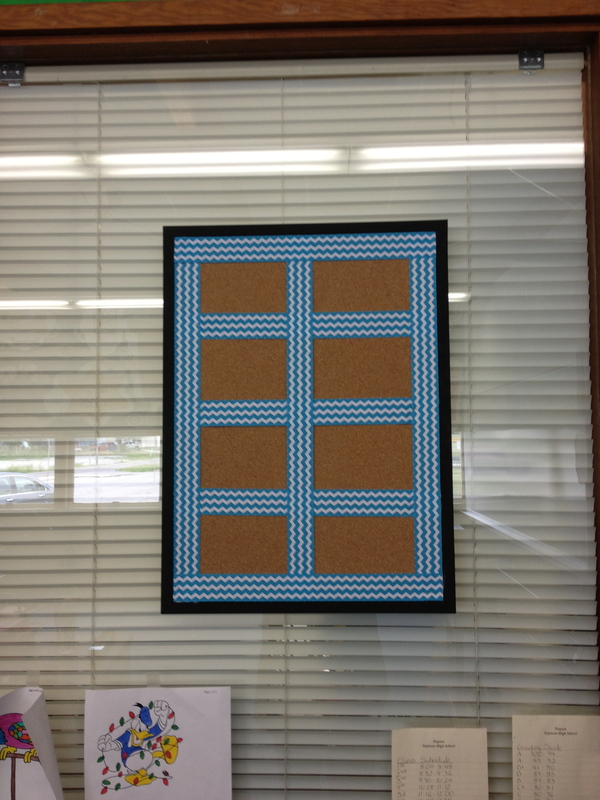 I have a set of windows behind my desk and using the 3M velcro strips, I hung the board on one of the windows. Using the same ribbon as before, I divided the board into 8 sections – one for each of the periods in the school day. The latest addition of my classroom projects. I hope you some of these projects inspire some of you to add your own personal touches to your classrooms! I have had fun making these and have rediscovered that painting can be a great stress-reliever. I wish you all a great school year and please feel free to share any projects you have created for your rooms! Aboard the S.S. Kroonland, Valentina Meyer, a beautiful, mysterious woman wearing a white evening gown, admits to being a stowaway on the ocean liner headed toward Ellis Island. Now a passenger with a secret and an uncertain future, she becomes the central figure around whom the lives of a small group of first-class passengers revolve. Henri is a sculptor who unexpectedly falls in love with Billie, a young lady dependent upon a gentleman to support her. But Billie has a secret that will change her life and that of William, the gentleman upon whose generosity she relies. Thomas, traveling with his sister Victoria, falls desperately in love with Valentina, resisting his sister’s attempts to prevent their relationship. Lily, a sharp, analytical young woman bound to a wheelchair, befriends Henri as she observes the goings-on. A symbolic journey that investigates the natural transitions between phases in our lives, She Wore Only White explores the deepest recesses of the human heart. She Wore Only White by Dorthe Binkert (translated by Lesley Schuldt) was the August Pi Phi Book Club pick. Yes, I realize that it is only August 2nd and I am already writing this review. I technically started reading the book in July (July 31st) so I guess I got a little bit of a head start. She Wore Only White is a very intriguing novel as the reader learns more about the different characters aboard the ship, the S.S. Kroonland. It felt to me as though this novel centered around two characters more than the others: Valentina (the lady in white and a high-class stowaway) and Henri (a sculptor headed to St. Louis for the World’s Fair with secrets of his own). Both Valentina and Henri have past lives that continue to haunt them as they search for where life will be leading them. Their lives seem to reflect one another’s even though they have never met before being on the ship. It seems that fate and circumstance bring them together to allow them to meet their futures without the fear of the past haunting them. 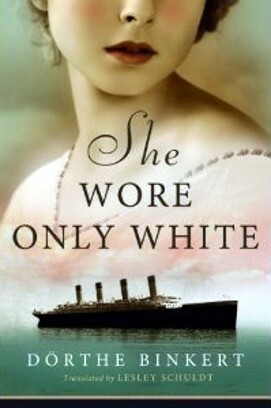 What I found most interesting about She Wore Only White, was that the author, Dorthe Binkert, was actually inspired to write this story based on a newspaper article that was originally written in 1904 and then republished in 2004 about an actual “Lady in White” who was a stowaway on the ship that is named in the story. Even though the journalists were never able to find out this woman’s true story, Binkert obviously felt compelled to create one for her more than 100 years later. Binkert was obviously most focused on the lives of those that were traveling with the highest of standards, as the entire novel focuses on the lives of those in first-class. There are only a few mentions of the second-class passengers and the steerage passengers. It felt as though the descriptions of the steerage passengers were included only to show the stark contrast in conditions between them and the first-class. (This does not include your “Titanic type” of first-class-passenger-meets-steerage-passenger-and-they-fall-in-love story.) Instead we are thrown head-first into the lives of these passengers and we only experience them in a very short time frame — only the days that they are on board the ship. Having such a short amount of time to get to know these characters left me wanting to know more about them in the end. I was very curious as to the resolution of all of them. Another part of the novel, the Prologue and the Epilogue were actually not told from the perspectives of any of the first-class passengers that we meet through the rest of the story. This once again left me wanting more from the author and left me with so many more questions that I had hoped would be answered during the Epilogue. Despite these unanswered questions in She Wore Only White, I felt that the story actually flowed very well, even with all of the differing perspectives. It truly felt as though the reader is on the ship with the passengers and is meeting them one by one each day and then coming back upon certain characters as we learn more about them. I found She Wore Only White to be a fascinating read. I enjoyed getting to know each person aboard the ship and wanted to get to know each of them a little better. I don’t want to give anything away about the ending of She Wore Only White, so all I will say is that this novel will definitely make you think about these people’s lives and your life as well, and the choices that we must make. It is an easy read, although I’m sure there are things that other readers might feel are lacking. Some of these things might include the lack of depth of character for those other than Valentina and Henri. Again, I believe that this is simply because we are only given 9 days out of the entire lives of these people…just as though you (the reader) are meeting them on a cruise ship: you get snippets and then never see that person again once the voyage is over. She Wore Only White is another great historical fiction novel that I have come across, and I am very impressed with the work of the translator, Lesley Schuldt, for keeping the flow and feelings that were originally created by Dorthe Binkert.